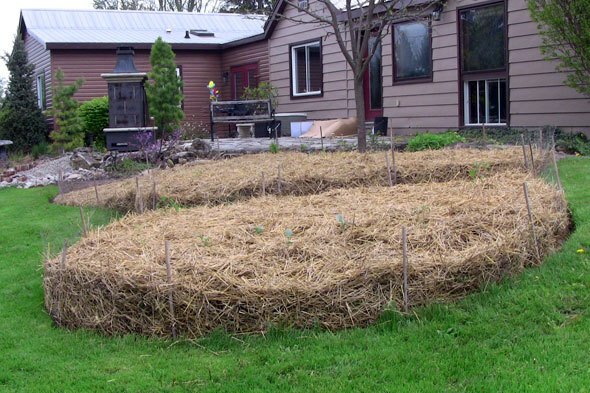 In permaculture, sheet mulching is often done near the house to prepare a kitchen garden. Sheet mulching is one of the best methods of building an organic garden, and today I’m going to show you how to mulch correctly to make a great sheet mulch. You may have also heard it called no till gardening or lasagna gardening, both of which mean the same thing. There are many ways to make a yummy lasagna and there are many ways to make a sheet mulch, but no matter how you do it, you can think of sheet mulching as kind of like composting right in your organic garden. It’s mostly done to create new garden beds, and occasionally in existing vegetable beds during the fallow season. 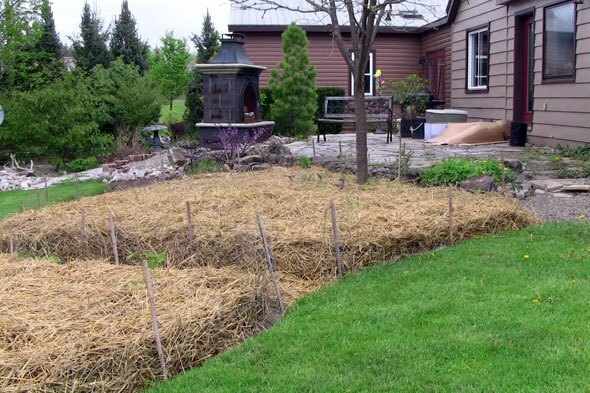 Sheet mulching is an amazing way to smother weeds and build fertility and soil structure at the same time by layering various materials anywhere from just a few inches to 18 inches high. It has a few advantages over composting, perhaps the biggest being that it’s less work in the long run. With a sheet mulch, you don’t have to get rid of the grass first, and once you put the materials down, that’s where they stay, whereas with composting you generally turn it a few times and then have to move it into your organic garden. Sheet mulch takes longer to break down than compost, but that also means it lasts longer as a mulch. At the same time, a sheet mulch generally doesn’t get hot enough to kill weed seeds and pathogens. Fortunately, if you keep a continuous mulch, most of the weeds will be taken care of anyway, and if you’re using a diversity of materials from good sources, the few pathogens you’ll be introducing will be taken care of, too. Unfortunately, some tenacious weeds can be introduced when sheet mulching, giving you some occasional weeding to do, so for some people, a proper compost pile can be less work in the long run. Also, if you already have slugs, you’ll probably have more when you build a lasagna garden. They love the stuff. That’s one reason why I put my sheet mulched vegetable garden in a sunny, hot spot and don’t over water, but a few often seem to show up anyway. It can be difficult to get enough materials to sheet mulch a big area, so it’s often best done for a kitchen garden right near the house, which will end up covered in my most important foods for daily picking, such as herbs and greens. I may even do this inside a raised garden bed. You can use many of the same organic materials for sheet mulching that you would use in a compost pile. Your main mulch types for nitrogen are manure, fresh grass clippings and even a few food scraps. For carbon – hay, straw and leaves. Plus we put some newspaper or cardboard on the bottom and perhaps some compost towards the top. If you’re a lasagna lover, you know there are many ways to make it. When I was a kid, my mom made incredible lasagna with lots of meat and cheese. Now, I follow a mostly vegan diet, and when I visit home, she’s nice enough to make incredible lasagna without meat and cheese. Likewise, there are many methods of making a sheet mulch. It can be as simple as newspaper on the bottom and a few inches of compost on top, but for the best results long term, you might want to do something similar to what I do. I start with a 1/2 inch layer of newspaper or cardboard on the ground to suppress weeds, and then water the heck out of it (which incidentally stops the newspaper from flying away before your next sheet mulch layer goes on). There’s no need to pull the weeds first. Even if you do this on a lawn, you don’t have to till up the lawn first – just mow it short and leave the clippings there. In fact, sheet mulching can be a handy way to deal with weeds you don’t want to put in your compost, or with turf you’ve removed from somewhere else in the garden. Throw them under the weed barrier layer and you’re good to go. Some people are concerned about the glues in cardboard and inks in newspaper, but they’re mostly fairly benign and should be broken down by microbes. I wouldn’t use glossy or colored paper, but I’m okay with the ink. My finished sheet mulch in a nice, curvy bed that integrates with the existing beds. So those are the basics. Did I leave anything out? Feel free to ask me questions below or let me know how you do your sheet mulch. Previous: How To Use Compost – 4 Important Things To RememberNext: Rock Mulching – The Best Mulch Technique Ever? In the past, I’ve always waited 6-12 months, but this year, I’mexperimenting with planting into it right away. I know some things likepotatoes and squash should do well. I’ll see about the others – I’llprobably plant 30-40 things. For each plant, I just dig a hole down into thesheet mulch and put a couple of shovels of compost in. I plant towards thetop, at the level of that top compost layer. How did it work out? We just bought ourselves a farm and nede a lot of beds in just a month for vegetables and flowers that are growing from seeds in our celler rigget now. Should we just start sheet mulch now or would it be better to just lay out newspaper and than 5 inch later of compost instead? Or do we neeed to remove the old gras first since we are already to late? For sure we need to prepare for next spring already aswell! It works okay, but it’s definitely not optimal. I wouldn’t rely on it for your main strategy. I could really use some advice Phil! I am planning on sectioning off a small area in my backyard for (what some might call) a semi-formal vegetable garden. Currently its covered in grass. I plan on having raised beds for the veggies and walkways between them. Should i sheet mulch the entire area?.. even where the walkways will be? I am hoping to plant into it almost immedietly after mulching and all. any advice you have is greatly appreciated. Thank you! Hi Nicky, no need to sheet mulch the walkways. Just put cardboard or newspaper or fabric on top of the grass and your walkway material such as straw or wood chips on top of that. Then sheet mulch the beds. You’ll probably need something to hold in the sheet mulch, which could be as simple as chicken wire or as complex as a wooden (or other) frame. If you’re going to plant right away, you’ll want a decent layer of well-finished compost near the top of the layer, and extra compost for the planting holes. It’s a little hit or miss as to which plants are happy in a brand new sheet mulch, but many of mine did well this year. So what I am wondering is do you direct seed into the mulch (like for lettuce, carrots, beans?) or are you only putting in transplants? It seems that there would not be enough sunlight for the little seeds to germinate, and the top layers too loose to hold the seeds….or maybe these plants only work in a mature bed??? I am planning on planting hundreds of carrots, parsnips and beans this year so I could really use some advice. You’re exactly right, Sara. I mostly transplant into a new sheet mulch, although big seeds like beans work okay. But leave an non-sheet mulched area for small seeds like carrots. If there are trees in the area being converted from grass to garden, how close to the tree trunk should the cardboard and other materials be? Also, is adding a top layer of landscape fabric (on top of the mulch) then covered with bark beneficial for long term weed prevention? Thanks in advance! Hi Jim, I leave the rootball uncovered to be absolutely sure there is sufficient moisture and air exchange to the roots. So no cardboard or mulch.Landscape fabric can do an okay job at stopping weeds, but the disadvantages are many, the most important being that it stops the process of organic matter and nutrient cycling when the leaves fall every autumn. If I come across it in a landscape, I pull it out. we would like to recycle wallboard/sheetrock by includeing it in our sheet mulching. have you tried this before? Most sheetrock/drywall has chemicals in it. Sometimes it can be quite toxic, while sometimes it’s not too bad. But I wouldn’t recommend using it in a garden. It can be recycled though, if you can find a facility in your are that takes it. Hi Jim, I think that’s a great way to use the soil as long as it’s topsoil (and not subsoil), which it sounds is the case, so go for it. I have found this just does not work in the moist weather of the UK – too many slugs and they lay their eggs in the mulch, which leads to even more slugs. Fully composted material spread as a top-dressing works better in moist climates. Yes, most mulches can exacerbate slug problems. Hi, I am currently planning a large scale Milkweed meadow (7 acres). We have a bit of Star thistle in the meadow. I had planned on solarization, and grazing to reduce the infestation before fall planting. However, I do have access on site to very large amounts of sawdust and mulch( its a fire wood industry )While I realize this may need to be removed before planting due to acidity, what do you think about smothering the whole area with mulch? I don’t think you’ll get enough benefit to make it worth the effort. I expect the star thistle will still come back after.